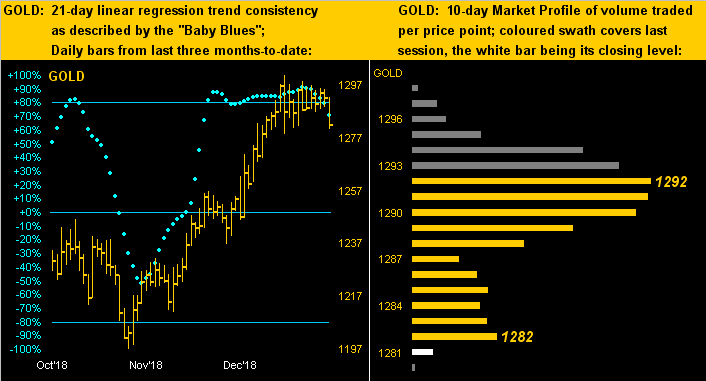 Opening note: with respect to the above Gold Scoreboard we've upgraded the line colours to make them more visibly distinct, the thrust of the overall picture rather cynically showing us that Gold's price these past few years hasn't materially gone anywhere in spite of the ongoing proliferation of foundationless fluff, (i.e. Dollars). A tip of the cap to valued reader LdK. As for lifeless Gold, price this past week became so flat-lined, indeed stuck in and just below "Neverland", (aka "The Whiny 1290s"), that the narrow trading range for the week's first full four days of only 10 points was less than Thursday's EDTR ("expected daily trading range") of 11 points. That's quintessentially lifeless. 'Course, Gold does have a hankerin' to go quiet when all is right with the world. Take for example the StateSide "partial" government shutdown for "non-essential" workers. It began effective 22 December, the S&P 500 Index having settled the night before at 2417: now 'tis 2670, an increase of 10% shutdown-to-date. Kinda like when a private sector company cleans house, earnings improve. Welcome to real life. "But actually Gold is up too, mmb." To be sure, the Baro did have a few positive inputs this past week: January index readings improved from both the Philly Fed and National Association of Home Builders along with December's Capacity Utilization ticking higher. But ignore thee not these negatives: for January, the New York State Empire Index and University of Michigan Sentiment Survey both severely slowed, as did Industrial Production for December, that month's core Export Prices and Producer Prices coming in as deflationary. Note above as well the rising S&P versus the falling Econ Baro: shan't last, never does. As for the S&P's price/earnings ratio, Bob Shiller's "CAPE" for the S&P is 29.4x and our "live" (based on actual earnings) PE is 38.8x. But then in the wee hours of Friday morning came an analyst's voice from the bedside radio putting the PE at 14x-16x: 'course, that's based on earnings that haven't yet happened. And to get from 38x down to 16x meanings actual earnings must double. Are they? For the 24 S&P 500 companies having thus far reported in Q4 Earnings Season, the median improvement (and this includes the corporate tax cut effect) from the like period in 2017 is only +15% ... not +100% ... no net dough, no moneyflow, look out below! In closing, our local power utility, Pacific Gas and Electric Company, is going into bankruptcy. 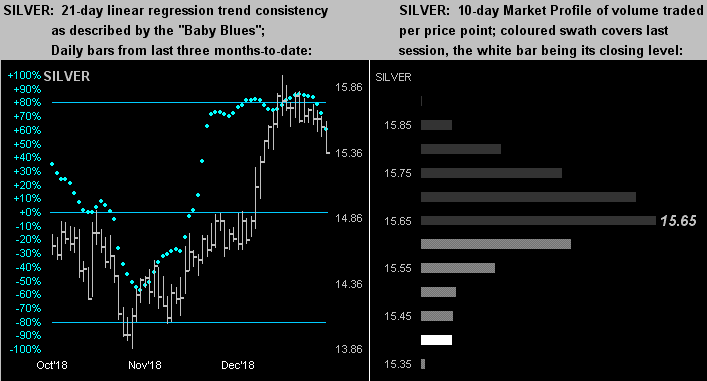 Thus our being sensitive that the lights may go out at any second, we'll try to squeeze in this closing quip per data compiled each week for our opening Gold Scoreboard. The U.S. money supply (per "M2") at this time a year ago was $13,852,500,000,000. Today 'tis $14,533,900,000,000 ... that's a year-over-year increase of $681,400,000,000. The budget for the so-called "Wall" is $5,600,000,000: thus in just one year there's been enough Dollar Debasement to budget 121 "Walls". Another day, another dollar, or as goes the tune "All in all you're just another brick in the wall..."--(Pink Floyd, '79). Instead, hopefully you're gathering your own supply of bricks: Gold bricks!